Roulette has a wheel with 37 numbers beginning from 0-36. 0 is colored in green and the rest of the numbers alternate between red and black. The object of the game is to bet on the winning number/color on the wheel. The wheel is spun and the croupier places a ball onto the spinning wheel. Gradually the wheel comes to a stand still and the ball lands on one of the colored numbers. STRAIGHT BET: You may bet on any number placing the chip in the center of a number. The maximum you can bet is multiplied by 35 times of the original maximum of the straight bet. SPLIT BET: You may place your bet on the line between 2 numbers. The maximum you can bet is multiplied by 17 times of the original maximum of the straight bet. STREET BET: You may place your bet on the boundary line of all 3 numbers. The maximum you can bet is multiplied by 11 times of the original maximum of the straight bet. CORNER BET: You may place your bet on the corner that meets between 4 numbers. The maximum you can bet is multiplied by 8 times of the original maximum of the straight bet. 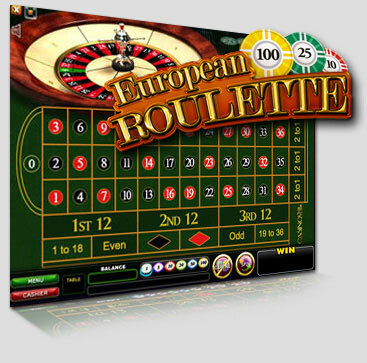 FOUR BET (ONLY FOR EUROPEAN ROULETTE): You may place your bet on the boundary line between 0 and 1, 2, 3. The maximum you can bet is multiplied by 8 times of the original maximum of the straight bet. Note: you may also place bets on 2, 3 and 4 numbers. For example: 1+0, 1+2+0, 2+0, 3+0, or 1+2+3+0. 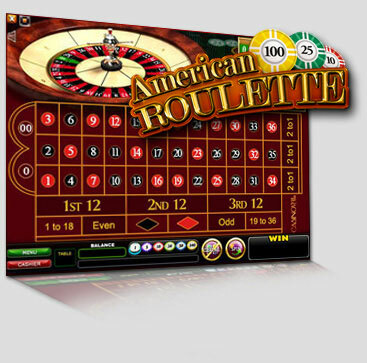 FIVE BET (ONLY FOR AMERICAN ROULETTE): You may place your bet on the boundary line between 0, 00 and 1, 2, 3. The maximum you can bet is multiplied by 6 times of the original maximum of the straight bet. Note: you may also place bets on 3, 4 and 5 numbers. For example: 1+0, 1+2+0, 2+0, 3+00, 1+2+3+0+00. LINE BET: You may place your bet on the boundary line of 2 rows of numbers adding up to 6. The maximum you can bet is multiplied by 5 times of the original maximum of the straight bet. COLUMN BET: There are 3 compartments at the base of the 3 columns that state "2 to 1" (the odds). You may place your bet in any of the 3 compartments. If 0 is hit, you loose. The maximum you can bet is multiplied by 2 times the original maximum of the straight bet. DOZEN BET: You may bet in the compartments stating "1st 12" (1-12), "2 nd 12" (13-24) or "3 rd 12" (25-36). The odds are 2:1. If 0 is hit, you loose. The maximum you can bet is multiplied by 2 times the original maximum of the straight bet. EVEN/ODD, RED/BLACK, LOW/HIGH: Each of these compartments cover half of the numbers on the table. The maximum you can bet is multiplied by one times the original maximum of the straight bet. There is an additional compartment in American Roulette which contains 00. Basically meaning the odds are at 38:1. There is only one 0 in European Roulette. Basically meaning the odds are at 37:1.